05.11.18 :: Categories: Get Involved. News Types: Press Releases. 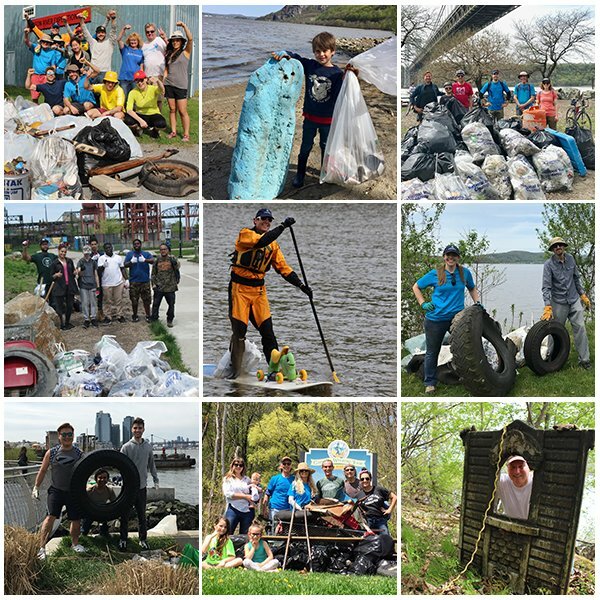 Ossining, N.Y. – The 7th Annual Riverkeeper Sweep brought out more volunteers at more locations than ever on Saturday, May 5, when over 2,200 people came out to remove trash and invasive plants from 120 sites along the Hudson River. Here are some of the results of the one-day effort that stretched from source to sea – the Adirondack Mountains to the waters surrounding New York City. • 37 tons of trash and debris were removed from the shorelines. • 194 tires were removed. • 466 bags of recyclables were collected. • Plastic waste again dominated the shoreline trash – bottles, bottle caps, straws, foam containers and plastic bags. Cigarette butts, glass bottles, aluminum cans and scrap metal were also common at some sites. • Invasive plants removed from the shorelines included water chestnut, mugwort, vines, garlic mustard and Japanese knotweed. • “Stop Pollution Please” messages were stenciled next to 20 storm drains in Ossining, demonstrating that drains on our streets often lead directly to waterways and contribute to marine debris. 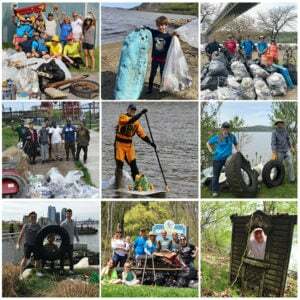 The seven Riverkeeper Sweep events held since 2012 have involved more than 10,000 volunteers who carried out 615 service projects across hundreds of miles of shoreline. In total, they have removed 226 tons of debris, planted 2,278 trees and shrubs, and removed tons of invasive plants. The results are based on reports by Sweep leaders, who count the bags and estimate the weight of bulky items collected. Detailed surveys on the types of trash were performed at certain locations, and those results are still being compiled. Schools, community groups, scouting organizations, park staff, paddling groups and others organize the local projects. The efforts ranged in scale this year from a cleanup by 120 volunteers at Jennifer’s Annual Flushing Bay Shoreline Cleanup to a one-person cleanup of Sparta Creek in Scarborough (thanks to Tom Comiskey). Tires were widespread along the river and its tributaries. Volunteers removed 21 tires from Croton Point and 20 tires from the Wallkill River. Along the Rondout Creek, Sweep volunteers managed to haul out 15 tires but spotted 60 more to be removed in the future. Volunteers were asked to count the number of single-use plastic bags they found on the shorelines, demonstrating the need for a statewide bag ban that places a fee on paper bags and encourages consumers to rely on reusable bags. At Corning Preserve in Albany, 52 bags were counted. At the end of Meeker Avenue on Newtown Creek, where repeated cleanups aim to foster a street-end park, and nearby Apollo Street, volunteers estimated the number of bags at 750. Saugerties: two metal drums, one plastic drum, two lawn machines, hose reel, seed spreader, Styrofoam, piece of plastic furniture, rusty metal, one half-submerged canoe. Red Hook, Tivoli Landing: water bottles, car trash, granola bar wrappers, Styrofoam, bait buckets, lure wrappers, fishing trash. Staatsburg, Mills Historic Site: four ropes, a lot of flip flops, life jackets, plastic drain pipes, old telephone poles, oil containers, propane tank, 12 bags full of water chestnut (invasive plant). Esopus, Lighthouse Park and Esopus Meadows: grates, child seat, plastic sheet, barrel, wood pallet, 56 plastic bags. New Windsor, Kowawese Unique Area at Plum Point: food wrappers, fishing line with hooks, three diapers, two syringes, large pieces of foam, a rim for a car tire, old car radio, metal brackets, three balls, foam food containers, a few paper plates, broken plastic pieces, bottle tops. Beacon, Dennings Point: 4 tires, floating dock section, trash cans, scrap metal, plastic bottles. Garrison’s Landing, Arden Point: plastic bottle caps, hockey puck, car bumpers, plastic barrel. Peekskill, Annsville Creek: refrigerator door, plastic toys, softballs, old computer systems, miscellaneous steel industrial components, metal bed springs. Englewood Cliffs, N.J., Bloomer Beach: straws, thousands bottle caps, cigarette butts, large pieces of Styrofoam, car parts. Queens, Newtown Creek, Dutch Kills: scrap wood, scrap metal, emergency bell, mini disco ball, bricks, plastic bags, contractor bags, three car seats, car door, car windshields, 12-foot metal shelf. Brooklyn, WNYC Transmitter Park: plastic and glass bottles, aluminum cans, plastic bags. Brooklyn, Meeker Avenue and Apollo Street: pipes and wires, sheet metal, 750+ plastic bags. Riverkeeper Sweep inspires year-round efforts to address sources of pollution and reduce consumption of single-use products like straws, bottles and bottle caps, foam containers and plastic bags. This year, Riverkeeper and its partners are collecting signatures in support of a statewide ban on single-use plastic bags in New York, modeled on California’s law with a fee on paper bags (Senate Bill S7760 / Assembly bill A9953). Members of the public can stay involved by visiting Riverkeeper.org, following Riverkeeper on Facebook, Instagram and Twitter, and texting RIVER to 21333. Riverkeeper is grateful for the support of HSBC, JSA Financial, EILEEN FISHER, Ironshore, The Berger Charitable Foundation, Louis Berger, Hudson River Bank and Trust, and the AVANGRID Foundation. Riverkeeper is a member-supported watchdog organization dedicated to defending the Hudson River and its tributaries and protecting the drinking water supply of nine million New York City and Hudson Valley residents. For more than 50 years, Riverkeeper has helped to establish globally recognized standards for waterway and watershed protection and serves as the model for the growing Waterkeeper movement that includes more than 300 Keeper programs around the globe. Visit us at riverkeeper.org.